Beverly Hills and Rodeo Drive is located 3 miles from Hotel. Santa Monica Beaches are located 4 miles from Hotel. Santa Monica Pier is located 4 miles from Hotel. 3rd St. Promenade in Santa Monica is located 4 miles from Hotel. The Getty Museum is located 5 miles from Hotel. 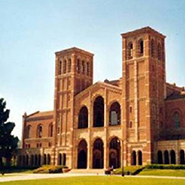 The BEST WESTERN Royal Palace Inn & Suites is located just 2 miles from UCLA and Century City! 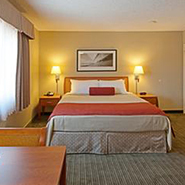 Our king guest room includes a pillowtop mattress, fridge, microwave, and more! Enjoy our dry sauna room or relax in our outdoor hot tub & pool. Flexible meeting space, host up to 35 guests with theater-style seating. Located just minutes from famous LA beaches and attractions. When visiting Los Angeles, make the BEST WESTERN Royal Palace Inn and Suites your vacation and business headquarters. The hotel is located 2 miles from UCLA and Century City and just 4 miles from the Santa Monica and Venice Beaches, Beverly Hills, Rodeo Drive, Marina del Rey and the Getty Museum. We are 3 Diamond rated by AAA and offer a complimentary breakfast, free local calls and 800 number access. All rooms have a microwave, refrigerator, coffee maker, iron and ironing board and cable tv with over 60 channels. The hotel has an outdoor pool, hot tub, billiards room, exercise room, dry sauna, guest laundry and a conference room. 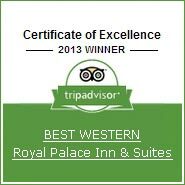 The BEST WESTERN Royal Palace Inn and Suites will offer you value, comfort, convenience, special rooms and numerous amenities during your stay.